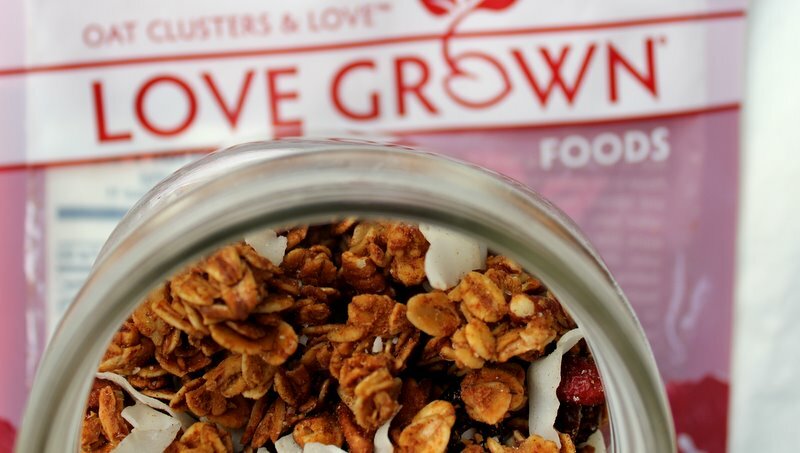 The LOVEly folks from Love Grown Foods sent me some granola to sample and so far I’m loving it! Besides the cute name, I am also a big fan of the whole food ingredients in all of Love Grown Foods products-they are nutritarians too! For breakfast I opened the Sweet Cranberry Pecan granola. Crunchy clusters, ample nuts, and just the right sweetness. These oats are neither oily nor candy-sweet, two qualities that often keep me away from granola. It tastes like delicious, nutritious REAL food, which is obviously right up my ally! 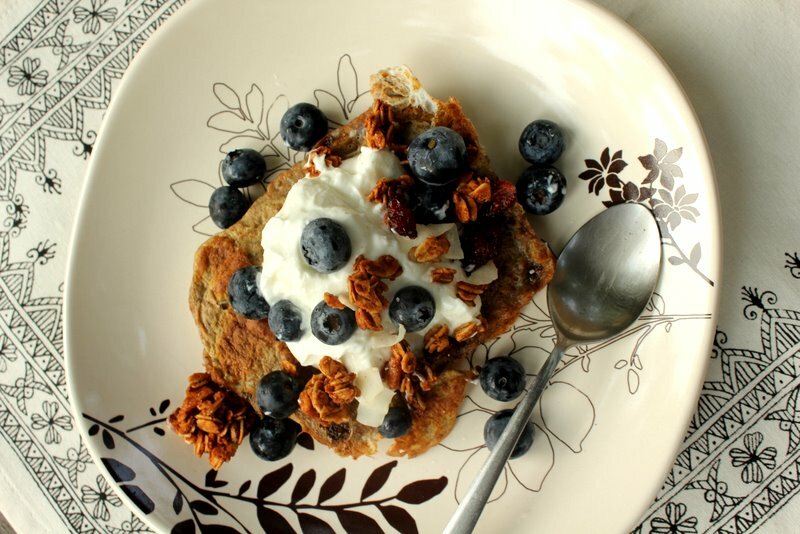 I made a piece of french toast with Matt + Kath‘s Great Harvest Cinnamon Walnut Raisin bread, topped it with plain Greek yogurt, organic blueberries, and half a serving of granola. Damn good. 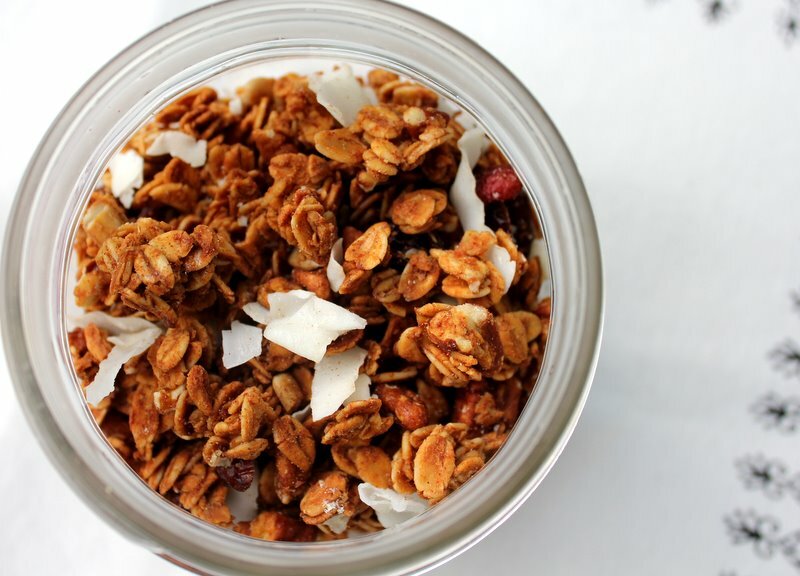 I LOVE (last one, promise ;)) that this granola uses honey and agave instead of refined sugar! Breakfast powered me up and off I went on a mini duathlon. I didn’t feel like running around my neighborhood, what I was really craving was a trail run but Tate had the car. So I biked to the trail! I biked-ran-biked for a total of 5 miles biking and 4 running. It was a really fun way to start the day and get an hour of cardio! If you were hoping to find the spiced salad dressing recipe in this post, sorry! I can’t give you a recipe ONLY because the key ingredient is a homemade spiced peach-plum butter that I made last fall. Here’s the basic idea and if you want to play around it apple butter or something, let me know how it goes. I love that the fruit butter thickens and sweetens the dressing without a lot of oil or refined sweetener. Makes about a half a pint. Use a small whisk or fork to mix. Add 1/4-1/3 cup spiced fruit butter and lavender salt (or salt and crushed lavender). Put a lid on the jar and shake until it’s all mixed up. Taste and adjust to your taste preference. Seriously-let me know if you try this dressing with another fruit butter! Hi! I just found your blog today putting around the internet, and took the chance to read back a few months – and I have to thank you for putting your thoughts and ideas out there into the world! You are so insightful and have such a beaming spirit! Maybe it was the perfect time for me to read some of these ideas – but most definitely keep putting them out there! Wow, thanks for the sweet and thoughtful comment! I really appreciate the feedback. If you are looking for a “cinnamony” salad dressing, Peas and Thank You has an awesome Cinnamon Dijon Vinaigrette that I have been addicted to lately. I make pumpkin butter every fall so I’ll bookmark this and try it when I make some this year. My supply from last year is long gone which means I should make more than one batch from now on. Never tho’t of using it as a base for a dressing. Yeah! Pumpkin butter would probably work great!